GT1 > Blog > Uncategorized > Thanks Frederick! 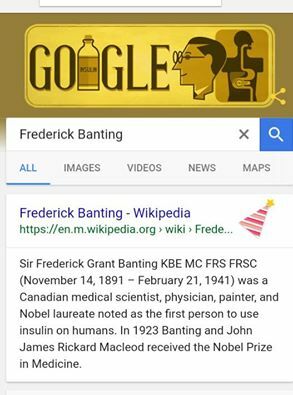 It was World Diabetes Day yesterday, celebrating the birthday of Sir Frederick Banting, who is responsible for my daughter and my husband, as well as all people with Type 1 Diabetes, being fit and well today. I turned on my computer in the morning and was greeted with a lovely picture from Google who also recognised his birthday. The T1D social media groups showed absolutely hundreds of photos and statements about this amazing man, Frederick, who has saved millions and millions of lives, and GT1 has also been sharing his name and achievements as well. I don’t like to think about what would have happened if Frederick had let discouragement get him down, and perhaps his perseverance is a lesson for me this week. With battles to get blood glucose levels to a happy balance (an impossible task really!) and dealing with failed sensors, and dodgy pumps, as well as life continuing with all the usual speed bumps to navigate as well, it is easy to feel a little discouraged. Perhaps the best thing to remember is that, as someone once told me, you can only climb a mountain one step at a time. As I work excitedly towards getting everything ready for our pop up shop in Swan Walk on Saturday, and plan the next GT1 teacher training session for our work in schools, I suddenly feel a bit lighter. If Frederick could battle through with limited technology and funds, and still save millions and millions of lives, perhaps we can hang on to the fact that pretty much anything is possible!